On day two of my 12 Days of Christmas giveaways, I give you beautiful entertaining pieces from Food & Wine For Gorham ! Last month, I reviewed their Modern Farmhouse 16-Piece Dinnerware Set ($99) and Ellery 20-Piece Flatware Set ($40). These gifts are perfect for re-gifting to someone special (shhh I wont tell) or keeping for yourself. 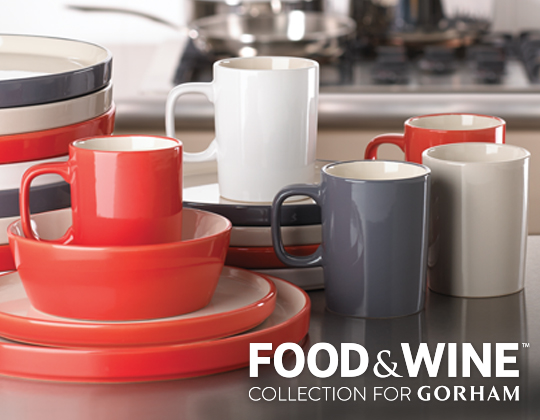 I cannot express how much I love the Food & Wine for Gorham collection which is sold exclusivley on Amazon. I have received multiple compliments on these pieces and they have proved to be a conversation starter. This comes to no surprise as the collection combined the expertise of the FOOD & WINE Test Kitchen with the editors’ love for beautiful and highly functional design. Let me know in a comment below which color you would choose from the Modern Farmhouse dinnerware set: Dusk, Flame, White, Barley. You should see a Rafflecopter Widget below this - after you comment, go through the widget to gain your first entry and unlock more chances to win. If it doesn't appear right away, please give it a few minutes and refresh. Make sure you come back every Monday-Thursday over the next three weeks for a chance to win something perfect for that special someone in your life (or keep it for yourself!). Click here and scroll to the bottom of the post for the full lineup over the next three weeks. There are some pretty great prizes! LOVE the dusk. It literally goes with everything! Hmmm. Think I'm gonna have to go with dusk. No, flame. No, dusk. This is hard. You sounded like me when I had to pick one color. I went back and forth between dusk and flame like 10 times. I would go with dusk....or barley! I'm so indecisive! Love the style of these though :)! Great choices! Yes, these are amazing! Great choice :) I love mine! Tough choice between the dusk and the barley! Love them both but the dusk is beautiful! I think I would like the Barley best. I love the barley - my other plate set is off white or I would have probably chosen that one. I would choose the flame set. Not bad at all!! My other set is beige for that exact reason! I would love the White! Great choice! My other plate set is white - since it goes with everything. I think I'd choose Flame but Dusk is also beautiful. Both are very pretty choices! all the colors are fabulous! I love taking and posting food pics so I think the dusk or barley would be perfect!!! And, my husband and I have been married 6 years and we've never had a full set of either flatware or dinnerware- always getting hand-me-downs! That's crazy! I'm crossing my fingers you win! Whoops, I think I got the wrong form haha. I like the red! I had a hard time choosing between flame and dusk. Oh man. Can you believe that I don't have a dinnerware set?? It's true...and also sad. We just have a mishmash of things haha. If I win, I will quickly decide between Dusk and Barley. Right now I just can't! Um, that is crazy!!!! I hope you win! I love the barley ones! Fingers crossed!